These are some of our plainest pieces. They are nice to use and have quiet but lasting appeal. Sometimes we have more than one of each product available and it is possible that the item you buy may vary slightly from the image and description shown. 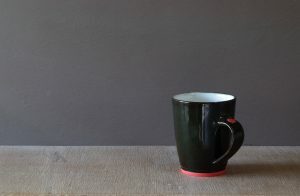 Low coffee cup glazed in grey with orange foot.